Ironically, despite all the recent transit-oriented development in Portland, the heart of Sunnyside cannot be currently reached by either Max or streetcar. Instead, you need to board the Tri-Met bus #15 from downtown Portland, and if you do so in the middle of the day- as I did- be prepared for a crowded, stuffy, and long bus ride, as it took me over twenty minutes from when I boarded the bus at noon and stepped off on Belmont right in front of the Pied Cow Coffeehouse, 3244 SE Belmont St. Housed in a supposedly haunted late Victorian-style mansion- which is common to see throughout Sunnyside- the Pied Cow offers a selection of coffee drinks, scratch-made desserts, and flavored tobacco to be enjoyed with a hookah in the backyard garden. The neighborhood is anchored by the Belmont Dairy Apartments, 3340 SE Morrison St., a redevelopment project that in the mid-1990s retrofitted a derelict century-old dairy into mixed-income housing over a few blocks, one of the first projects of this kind in all of Portland. The Dairy houses studios, one and two-bedroom apartments, along with townhouses over a two-block span from Belmont to Alder Street. 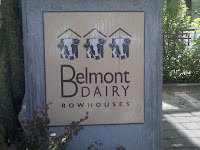 Since its inception, Belmont Dairy has established established itself as a desirable place to live, resulting in property manager Nicole Phelps informing me that the Dairy was currently at “100% occupancy” and, as a result, had no literature for the Apartments to distribute. Ground floor retail in the development includes the original Zupan's gourmet grocery store, 3301 SE Belmont St.,; the Belmont Inn, 3357 SE Belmont St., the epitome of a neighborhood bar; and the Hobnob Grille, 3350 SE Morrison St., which is the sort of bar which promises an Old Fashioned that will hit the spot. A block east of Belmont Dairy you will find the Belmont Avenue Lofts, 3442 SE Belmont St., the first redevelopment mixed-use condominium project on Portland’s east side, which opened in 2004. The Lofts'distinct modern design presents a contrast to the otherwise earthy atmosphere on Belmont. A mix of various shops fills the Loft’s ground floor retail, including Salon Bucci, 3640 SE Belmont St., and the delectable treats (try the mushroom mattar!) featured at the India Oven, 3450 SE Belmont St. Across the Lofts to the east you will find the Historic Belmont Firehouse, 900 SE 35th Ave., built in 1898 and in continual operation until 2003, when a modern firehouse was opened on 39th and Hawthorne. The firehouse now currently houses the Safety Learning Center & Fire Museum, which can be visited on Saturdays, and by appointment during the week. The Piazza is a block north of Sunnyside Environmental Elementary School, 3421 SE Salmon St., a popular elementary schools in Portland that focuses on an integrated curriculum which provides a hands-on education devoted to environmental issues. A walk around the two-block campus provides testament to this curriculum. Colorful murals and mosaics designate the school’s playground from the park that Sunnyside shares with the public, while a white picket fence encircles the students’ gardens. The southeast corner is marked by a sign that simply states ‘Grain’, describing what can be found planted in that corner. A shady and well maintained garden, along with a community kiosk board and similar constructions made of natural building material can be found on the school’s front lawn. The campus's careful design invites passersby to stop and linger, reflecting on how education can be enhanced through an understanding and respect of the environment. Undoubtedly, Sunnyside Elementary is a jewel of the neighborhood, and it is of little wonder that many Portland parents attempt to have their children enrolled in the school. To check out Sunnyside's other main commercial drag, follow 34th Avenue south to Hawthorne, keeping an eye out for metal venus fly traps and other street corner home-made art. The hand-crafted sign of Pho Van, 3404 SE Hawthorne St., a local chain of Vietnamese eateries that offer a lip-smacking pho and other sweet & spicy soups (try the duck soup if you want to treat yourself), will indicate that you have arrived to one of Portland’s most eclectic and bohemian commercial drags. Hawthorne boasts multiple record stores, used furniture and curio shops, and vintage clothing shops. While Jackpot Records, 3574 SE Hawthorne Blvd., may have the latest colored vinyl release by the Decemberists or the Ting Tings, a few blocks west is Crossroads Music, 3130 SE Hawthorne Blvd., is where to head if you are looking to find that rare, collectible vinyl. Metro Clothing, 3525 SE Hawthorne Blvd., is where to go if you want to get any part of your body pierced, while Red Light Clothing Exchange, 3590 SE Hawthorne St., is the place to put together that extra-special Saturday night outfit. Ben & Jerry’s Hawthorne Scoop Shop, 1428 SE 36th Ave., offers the expected treats, while the Cup & Saucer Cafe, 3566 SE Hawthorne Blvd., currently celebrating its 20th anniversary, is a Portland institution for its 2 pm breakfasts. Ultimately, the best attribute of Hawthorne is the thriving street life, with an eclectic mixer of buskers on every corner- including, on my recent visit, an accordionist- along with overly aggressive Greenpeace petitioners. The best place to observe the onstreet interactions is the outdoor patio of the Bagdad Theater and Pub, 3702 SE Hawthorne Blvd., is the best spot for people-watching. Part of the McMenamin Brothers’ empire of reclaimed and retrofitted historical properties, the Bagdad hearkens back to Hollywood’s Golden Age, constructed by Universal Studios in 1926. You can finish your pint of Ruby Red outside, or bring it in and soak up the atmosphere while watching a second-run feature, as drinking beer while watching movies is almost a Portlander’s birthright. This exploration of Sunnyside is to serve only as a primer, as I've barely scratched the surface of two of Portland's msot liveliest commercial strips on either side of the neighborhood. There are many great new bars, eateries, and other hot spots popping up all the time, that a comprehensive blog post would be practically impossible. Instead, user-generated information to help fill in any gaps would be appreciated, with neighborhood residents providing the lowdown on any new local faves. One final note: the best way to check these thriving spots for yourself is through the respective neighborhood street fairs, with Belmont’s occurring Sunday, Sept. 12 and Hawthorne’s on Sunday, Aug. 15. Come and have fun at both fairs, and explore two of Portland’s most lively and interesting neighborhoods! To continue exploring Portland’s 20 minute neighborhoods, I next went to the Sunnyside neighborhood in Southeast Portland. Sandwiched by two commercial strips- Belmont to the north and Hawthorne to the south- Sunnyside is one of Portland’s oldest neighborhoods. Originally advertised as a suburb just miles away from downtown, on the “sunny side” of Portland (as opposed to the shadows caused by the West Hills.) 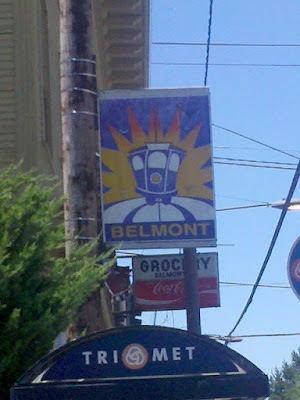 Sunnyside was originally reached by the first trolley line on Portland's eastside which ended at Belmont and 34th, explaining why the Belmont neighborhood's logo is an old-fashioned trolley car.